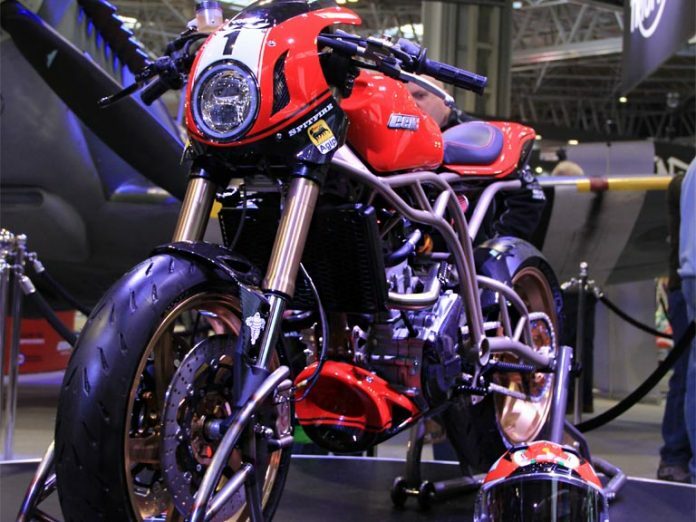 British manufacturers CCM Motorcycles have unveiled their new “Foggy Edition Spitfire”. It’s a slightly sportier and more stylish version of its predecessors the “Spitfire Bobber” and the “Spitfire Scrambler”. The Foggy Edition Spitfire was created in collaboration with the famous World Superbike racer Carl “Foggy” Fogarty; the most successful racer of all time, regarding the number of World Championships under his belt (or should I say race suit?). If anyone knows design for optimum performance then surely it is him. Powering the Foggy Spitfire is a 600cc single cylinder four-stroke engine, producing 62 BHP and 66 Nm (at 5,500 RPM) of torque. The “Foggy” boasts a Minuki D45 fuel injection system and six-speed gearbox. This machine has a multiple-disc, wet, hydraulic control clutch and averages 56 mpg. The engine comes standard with a stage one remap, which is really pushing the boundaries as far as stock standard bikes go. The frame of the Foggy Spitfire is crafted using high strength steel. 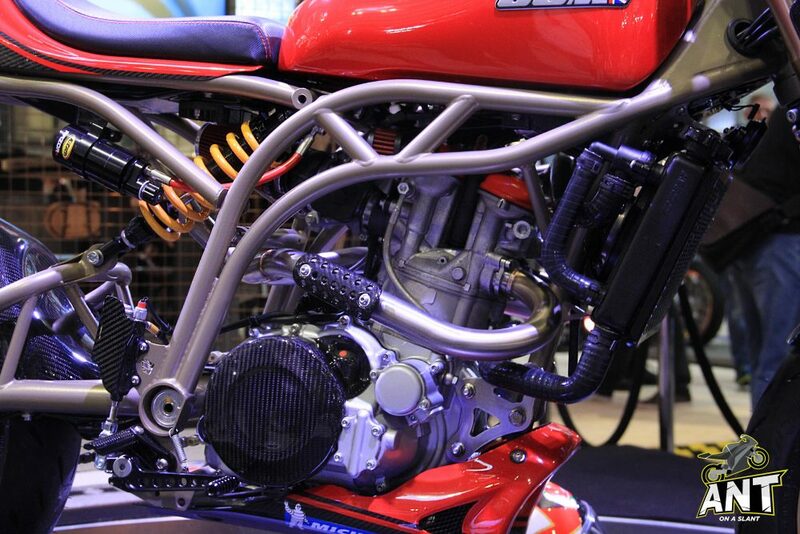 It’s carefully considered design pulls the maximum performance from the single cylinder engine. With a rake (fork angle) of 26°, the Foggy handles similar to a sports bike but has the aesthetics to stand out from the majority. Both the front and rear suspension is adjustable, meaning the Foggy can be suitable for almost anyone. The front braking system is finished off with a 320mm twin disc. The rear has a single 240mm disc which takes sole charge. What sets the bike apart from other bikes on the market currently is the weight (or very little of it that is). The dry weight of this machine is a measly 135kg, which won’t put any potential riders off. Even the lightest of riders could find themselves right at home on this masterpiece by CCM. One thing to be considered by the shorter riders among us, though, is the seat height, which stands at 830mm. This figure is similar to the 600 CBR standard seat height (820mm). However, CCM could in the future consider lower seat options and aftermarket suspension options to help compensate those shorter riders. The fuel capacity is 14 litres, big enough to get you to where you need to be going, and not too large that each fills up breaks the bank. 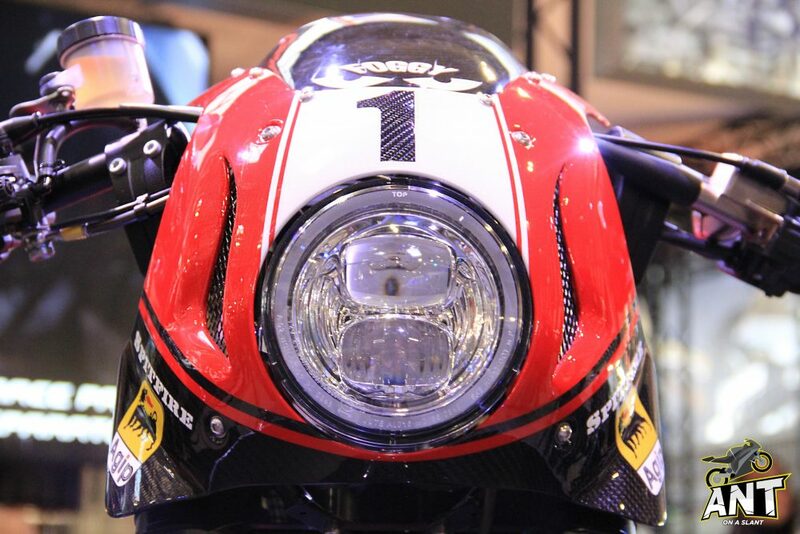 With a power to weight ratio of 0.41 HP/KG, this machine is sure to be the perfect fit for all riders. It suits everyone, from those that have just passed their test, to those that have been riding years and find it second nature. At a glance, this bike seems to cover all necessary bases. Now, on to the part that sets this bike apart from both its rivals and predecessors; the aesthetics! To look at, the foggy is a piece of art. 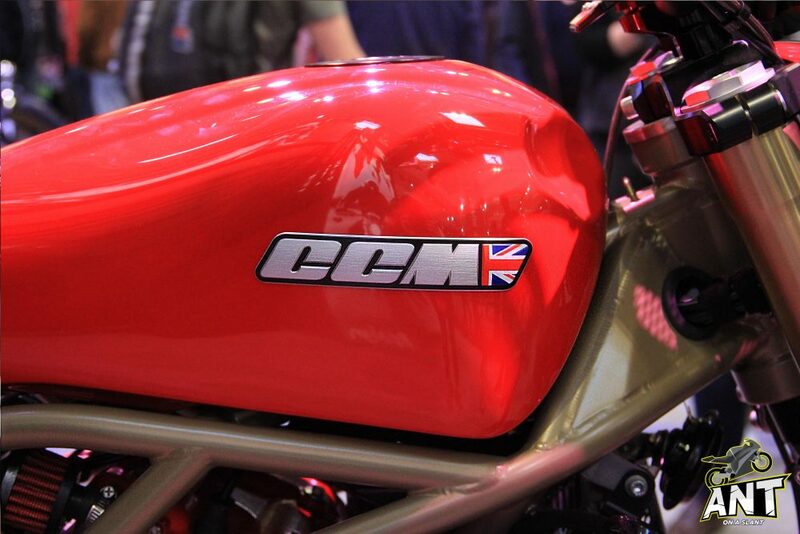 It certainly seems as though CCM have thought of everything when it comes to the bikes looks. Let’s start from the bottom. The 17″ rims are something to be spoken of. 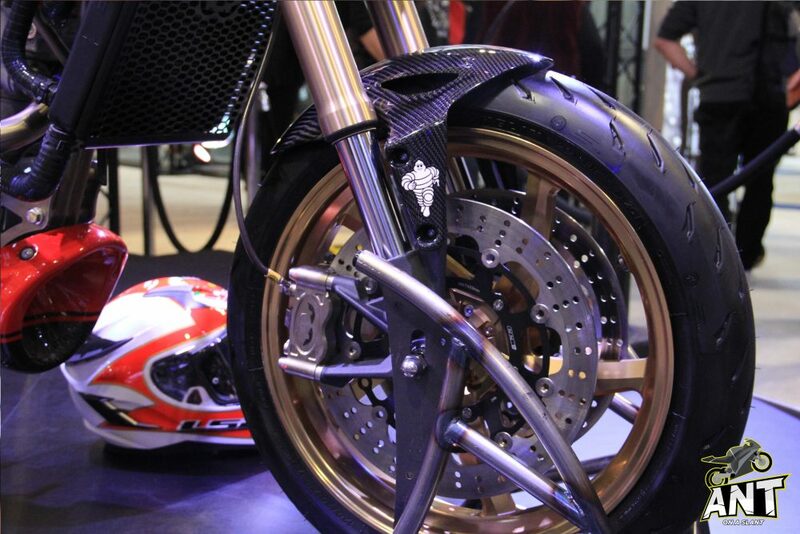 Coupled with a CNC hub and a gold finish, a nod to a certain red motorcycle made famous by Carl Fogarty. The look of the wheels will make any onlookers slightly jealous as they glimmer in the sunshine (or rain, as the British weather has so kindly turned to). The carbon fibre bodywork of the Spitfire Foggy edition isn’t something to glance over; it makes the bike lighter to handle than competitors, and aesthetically pleasing too! Furthermore, the race-inspired clip-on handlebars contribute to the sporty theme of this bike; they give a sportier riding style, which in turn makes the rider more aerodynamic and in tune with the machine. This enables the bike to reach its full potential. Something first seen in Sportsbikes alone was an under-seat exhaust. They clean up the side of the bike and let admirers delve into the fine details of the engine and mechanics without being obstructed by a chunky stock exhaust. Finally, to finish off the looks of the bike, CCM have incorporated Foggy’s signature into their design of the motorcycle. Foggy himself helped to design and create the basis of CCM’s concept. Foggy wanted to go the extra mile to ensure the motorcycle stood out in looks as well as handling. This meant that the bike comes with some added extra’s not seen on prior models. So here is what you get on top of the standard model. and Grippy Michelin Power RS Tyres. CCM has released the bike as “a machine that both looks and plays the part of a champion” and this indeed cannot be argued. With a starting price of £12,495.00, the CCM Foggy Edition spitfire is indeed a cat thrown among the pigeons in the biking world. With only 300 being made, I wouldn’t wait to dig your teeth into an outstanding machine. You can check out our Youtube video of CCM’s Spitfire Foggy Edition below. As an added bonus, the video includes footage of their custom Spitfire 6. Be prepared to be blown away by the paint job. Don’t forget to subscribe.